The Wegman family operated the Wegman Piano Factory on Logan Street. Established in 1882, the company was a division of the Estey Piano Corporation and was associated with several names, including Malcom, Love, Vough, Chase & Baker. The company was active in Auburn until 1915. The brick factory buildings still stand. Interestingly, Mrs. Julia Wegman is listed as the company president in 1900, an era where it was unusual to find a woman running a business. Mrs. Wegman died in 1922. The Wegmans lived at 100 South Street, and the house still stands. 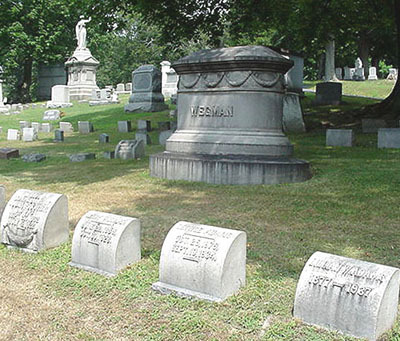 The Wegman monument is located in the Linden View section.